We reached out to the guys in Summit Racing’s renowned tech department—the largest full-time staff in the industry—to identify and answer the five common tech questions they hear on a consistent basis. With help from Summit Racing’s tech advisors and other industry experts, we’ll answer those questions here at OnAllCylinders. Today’s topic: fuel pumps. When we refer to fuel pump size here, we’re talking about the size or amount of fuel flow—not the pump’s physical size. More accurately, we’re talking about the fuel flow volume as measured in gallons-per-hour (GPH). What is the optimum GPH for my engine? In order to make the proper calculation, you need to determine your variables for this equation, starting with your vehicle’s maximum horsepower (Max. HP). You can determine this by having your vehicle dyno tested or by making a reasonable horsepower estimate based on the manufacturer’s advertised horsepower plus a conservative estimate of power gains made by aftermarket modifications. The second variable in the equation is BSFC, or brake-specific fuel consumption. BSFC is a measurement of the amount of fuel consumed per unit of power produced. According to Holley, an engine typically requires .5 pounds of fuel per horsepower every hour at wide open throttle. However, this number generally applies to naturally aspirated engines. In our example, you’d need a fuel pump that delivers 29 GPH of fuel. Whether you choose a mechanical fuel pump or an electric fuel pump, you’ll also need consider fuel pressure and its relationship with fuel volume. This relationship is inversely proportional—that is, as pressure increases the volume will decrease with everything else being equal. A certain amount of fuel pressure is always required to maintain engine performance by assuring that fuel is available on demand. As engine demand goes up, as is often the case in forced induction applications, the amount of required fuel pressure will increase, causing the fuel volume to the engine to go down. Other factors and conditions, such as acceleration G-forces and friction within the fuel system itself, will also affect fuel pressure. A basic understanding of this critical pressure/volume relationship is needed when designing the proper fuel supply system for your vehicle. You need to select a fuel pump that will meet your engine’s fuel volume AND fuel pressure demands. Many of the top fuel pump manufacturers offer charts that show fuel volume across a reasonable pressure range, so you can get the right balance for your vehicle’s fuel demands. You can also reduce sudden pressure rise and help maintain or increase fuel flow by modifying your fuel system with larger fuel injectors or other aftermarket upgrades. I have a ’99 Dodge Ram SLT LARAMIE W/ A 318 MAGNUM. I would like to know how strong is the 318 Magnum? I would love to get 400 hp/ 400 tq,is it possible? Due to the airflow restriction your of your factory 2 barrel throttle body, 400hp naturally aspirated will be difficult. Supercharging may be a route for you to consider. Yes, build your fuel system with a return line back to your fuel cell. That way, whatever is not used by the fuel injectors is returned back to the tank! Have a 351w bored .30 with a summit carb 600cfm i have a 35gph free flow pump will this be enough? Yes. Even with boring it you should only be around 250 hp on th high end if you havent done anything else to it. Even in the mid 300s that would be enough. I understand the equation for GPH but id like more info on fuel pressure. Im planning on running a mild twin 60mm turbo 13 psi. Demon 750 blow through. Planning for 500 to 600 horse. Thats 75GPH AT 600. Just a good street car. Wondering what fuel pressure i should be looking at. Setting your base fuel pressure at 5-7 psi (zero boost) is critical so as not to overcome the needle and seat assemblies. 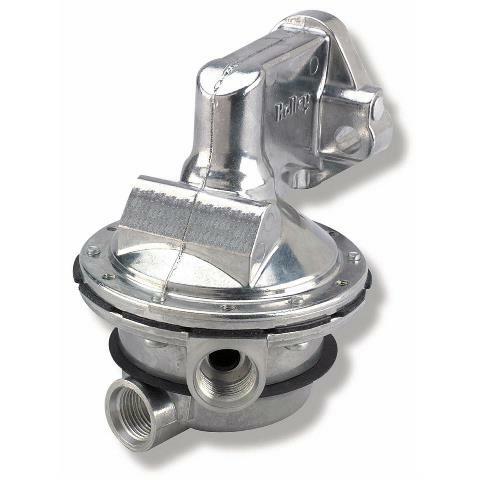 Then, using a boost sensitive fuel pressure regulator with a 1:1 ratio ensures that fuel pressure will rise one pound for every pound of boost from the turbos and keeping you from leaning out under boost. I have a 351w with a 600 cfm holley it is fitted with a regulator then filter then to the Holley the regulator is leaking so want to replace it and the filter what would you recommend? Chris, thanks for your question. We’d recommend a quick call to the Summit guys at 800-230-3030. They’ll likely have a few follow-up questions to get you the right setup. I have a 1982 chevy 350 g30 5.7 tioga motor home..it has a mechanical pump that has 7 psi and 40 gph…what size electric pump would I need ..will the airtex e8012s work it has 5-9 psi and 30 gph and would I need a regulator with it..